At Aba House we encourage creative interaction. Each summer we bring people from around the world to work with Ghanaian artisans. Many disciplines are explored. This summer one group will focus on African pottery. 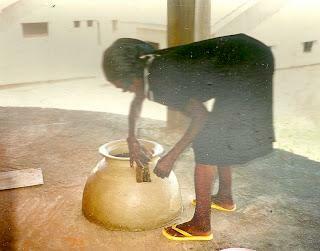 For a visiting potter being in Ghana is like letting a kid loose in a candy store. There is so much to sample. Ghana has 10 regions and each has it's own pottery traditions. Michael Cardew, a well know British potter, worked in Ghana from 1943-1948 establishing a workshop at Vume. Vume is still a thriving pottery center and on our list of places to visit. It is encouraging to see the pottery tradition continued, although on occasion one encounters plastic shopping bags where pots once sat. Are you a potter or interested in traditional African pottery? You can sign up for our (infrequent) mailing list at http://www.culturalcollaborative.org and we'll keep you informed about our workshops.